Do your headlights appear cloudy? This not only affects the car’s appearance but also substantially reduces the light’s brightness. This can be a safety hazard during nighttime driving. So, what are the causes of foggy headlights and what can you do to restore them? Headlights become foggy over time as a result of weather exposure. Most headlight lenses are made from acrylic, which oxidizes when exposed to UV rays. Newer cars have a coating over the lenses to prevent oxidization, but the coating eventually wears off. Flying debris in the form of road salt, dirt, and gravel smacks against the headlights. This contributes to the coating’s wearing out. Debris also causes scratches and pits that contribute to the faded and clouded appearance. Headlights these days are also made with a watertight seal. The seal can eventually break, leaving an opening that causes condensation to form inside the lenses. The water scatters the light beam, diminishing its brightness. Prevent as much sun exposure as you can. This means parking in the garage or in the shade. If neither option is possible, then park with the headlights facing away from the sun. You should also wash the headlights with every car wash. Polish afterwards using a non-abrasive polishing solution. Some people wash with baking soda or toothpaste to un-fog the headlights. This removes the oxidation but does not prevent future clouding. 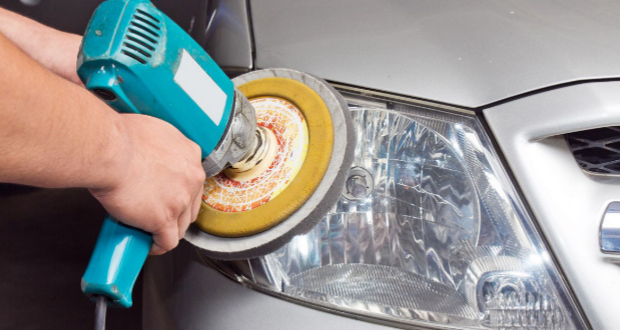 A professional cleaning is necessary to permanently restore the headlights. Bring your car to Bellingham Detail Auto Glass to give it a touchup. Our auto detail covers a full cleaning inside and out. Foggy headlights are not only an eyesore but also pose a potential safety hazard for nighttime motorists.